TuNgsten Tadpole. TNT because its dynamite! Mini lures are extremely effective for catching stream trout of all sizes and most species. Trout have a natural instinct to grab anything smaller than it “swimming” near its lie. This is not step downstream and fish down and across technique. TNT is a targeted form of fishing or can be used as a search technique fished upstream. They are available in several trout catching versions in sizes 12 (3 and 4mm tungsten beads) on a strong jig hook. These mini lures are perfect for appealing to the predatory nature of stream trout. It is the “Martini” technique because it can be fished anywhere and anytime in the pool. Deep featureless never fished sections of river can easily be explored. 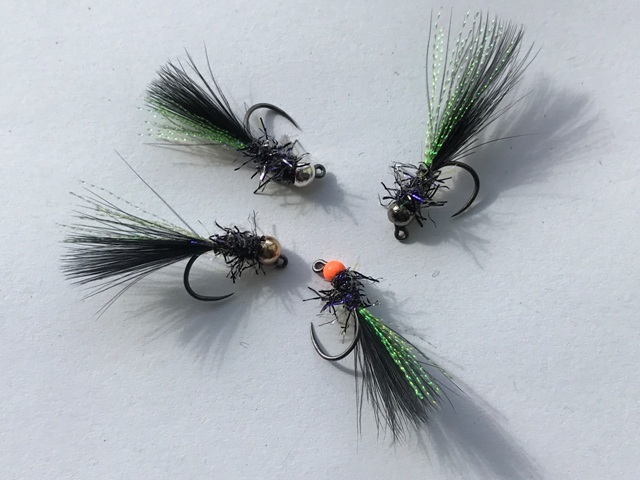 I used these to great effect for Cutthroat trout in British Columbia, on the Bow river Calgary, Canada for bullet bows, Colorado, the Himalayas and countless browns in the UK. £2.25 per fly. Choose bead colour below. TNT-Dark destroyer. Black for maximum contrast and stealth with a dark bead. TNT- Agent orange. Orange beaded head great in naturally peat stained or rising colouring rivers. TNT-Black and silver. Silver beads are a favourite of many Continental competition fly fishers and are popular with fish. TNT- The Midas touch. Gold head a firm trout favourite. Streamer patterns are often overlooked but can outfish all other flies in certain conditions or areas of stream. They can be fished all over the river. Fish it fast with regular twitches and be ready for explosive takes and heart stopping follows. 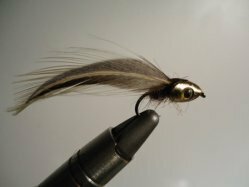 This is a great baitfish/minnow pattern and has already accounted for many fish on the wild brown trout streams of England. The fly is tied on a size 8 Hends 700 hook and available in Dark Grey colour.